Most tiny houses are made in this century and therefore look brand-spanking new but this home was built with the intent to look as though it’s been around for ages and we love it! 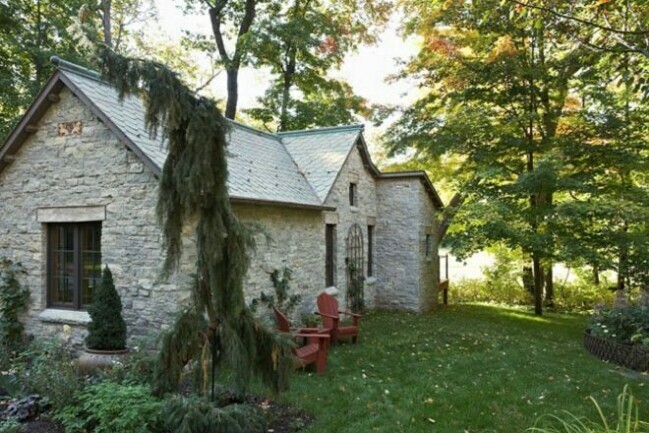 Minnesota design company, Murphy & Co., helped with the concept and construction of this one-of-a-kind 860 square foot home near Lake Minnetonka and the result is unbelievable. 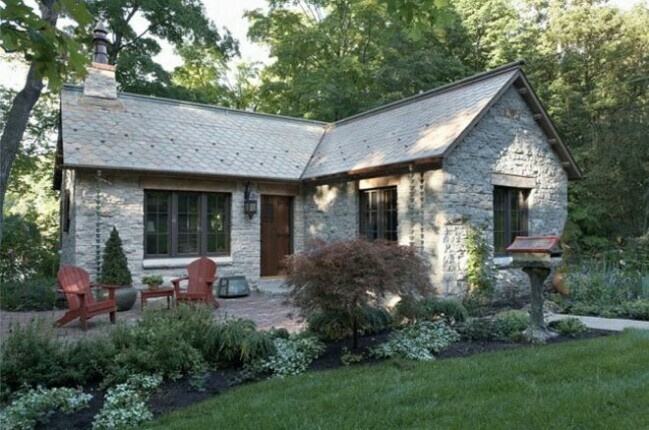 Known as the Gatehouse, the home was built using antique findings and reused materials for an authentic feel. 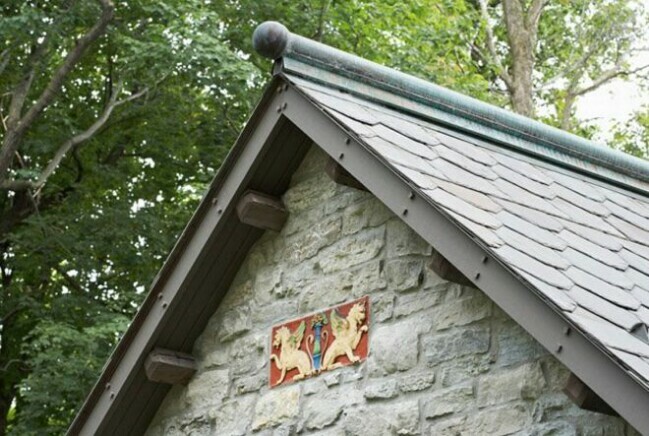 The roof is from a 1910s building in Pennsylvania and the limestone walls were scraps from the Lake St. Bridge. 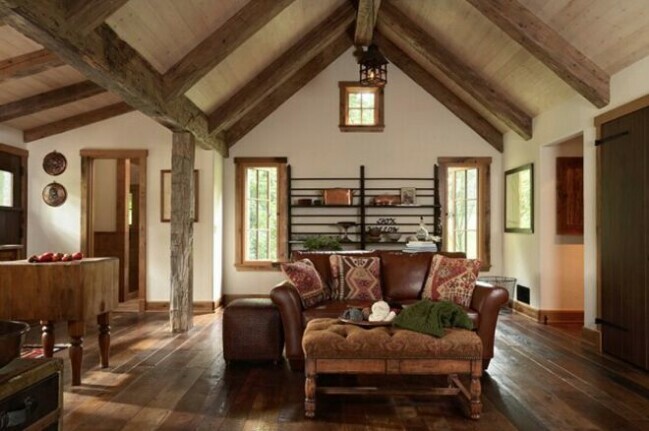 Inside, the house is cozy and warm feeling thanks to the earth tone color scheme and leather and wood furniture. The beautiful hardwood floors are from 1880s Wisconsin and were refinished to work perfectly in the home. 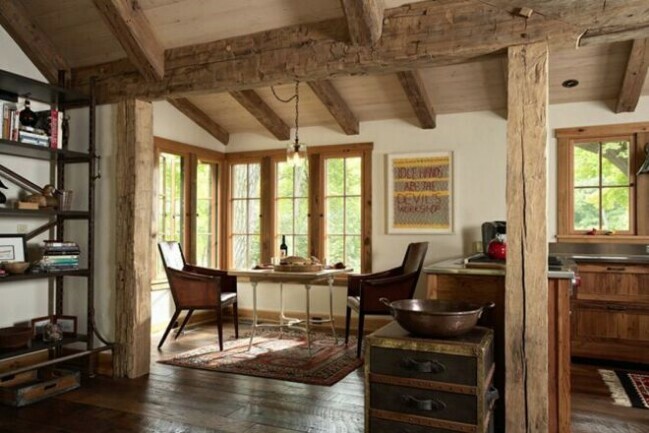 The chunky exposed beams and posts add character to the pitched roof and are from barns dating back to the 1860s and 1870s in Minnesota. One of the focal points in the house is the fireplace which was made from stone found in Iowa and kept rough-looking instead of being polished and recut. 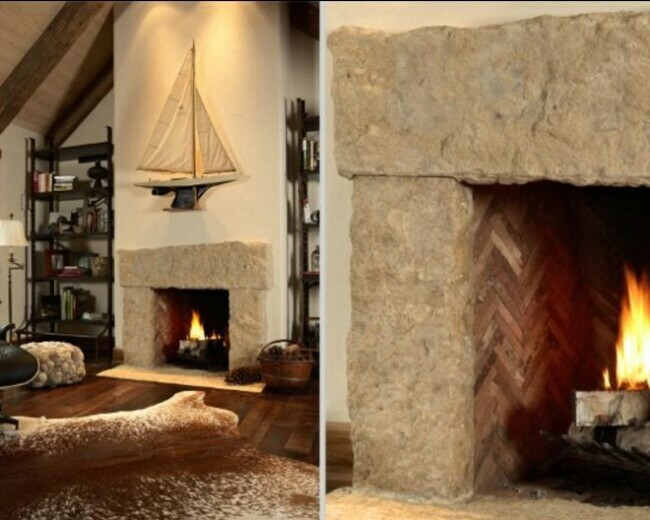 Even the inside of the fireplace was customized with herringbone stone! Off of the kitchen is a sweet little dining spot known as the “breakfast alcove”. The small table is surrounded by windows and is the perfect spot to enjoy a quiet meal or a game of cards. The kitchen is absolutely huge and takes up most of one wall of the house with an extra-long stainless steel counter and custom cabinets. We love the charming sconces that frame the large windows. 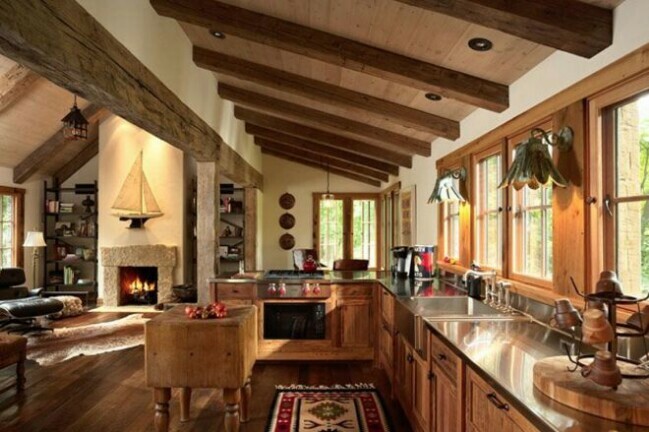 This modern kitchen has everything you need to prepare a meal and you’ll be doing it surrounded by rustic beauty. 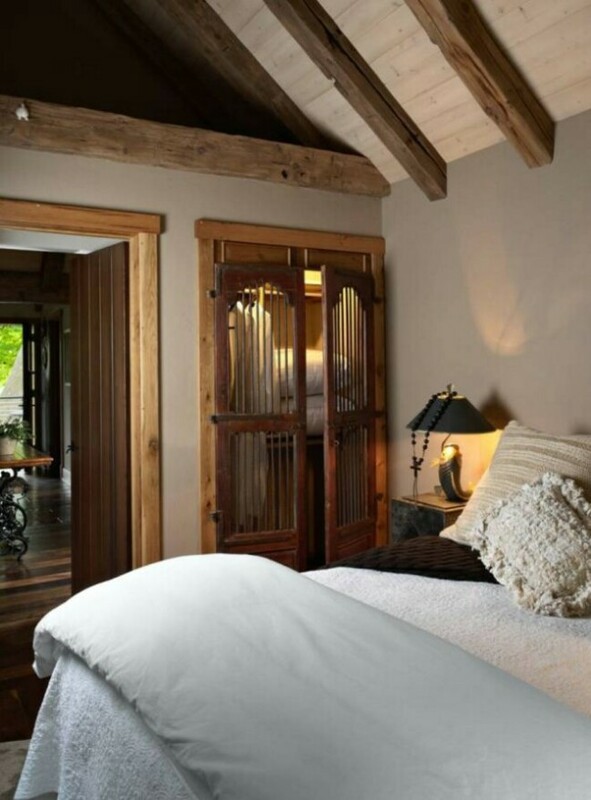 The bedroom has the same reclaimed wood beams that frame the ceiling and the builder used salvaged French doors to make a custom closet to hold extra linens and clothes. 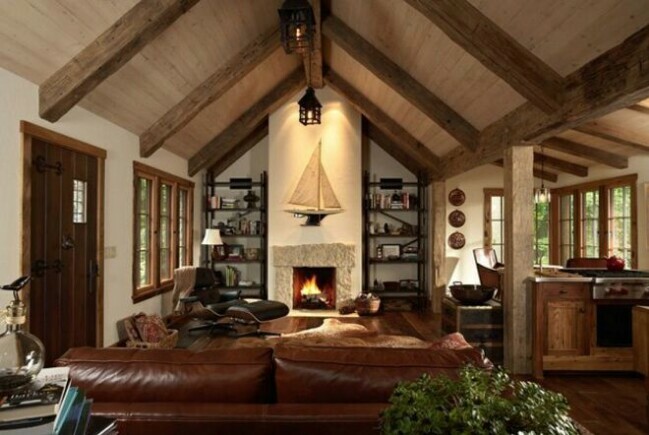 This room is just the right size to feel cozy and still spacious. 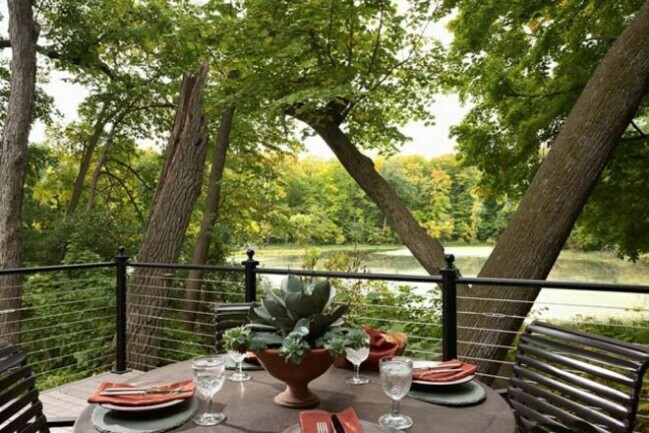 The porch of the house overlooks a pond and sits under huge oak trees for the perfect spot to dine outside. This house truly feels like a piece of history although it was built in the last several years. The builders did a remarkable job listening to the owner’s wishes and making them a reality. It’s just beautiful! Can you advise cost per sq. Ft. To construct? If you have to ask you simply can not afford it, sorry!!!! I agree that this is beautiful and done with and done with a lot of fore-thought but this is not a Tiny house in size or Prize. Only about 10% of the population can afford something like this. The 10% that can have it are the 10% that started by working on making it a reality. Not a “dream”. Make up your mind. Make a plan and it will start to happen. Looks like the materials are expensive…….. Contact: Mrs Donna (336) 283 6105 for any information. I would love to have the floor plan for this house. Absolutely stunning! I would move in in a heartbeat…wherever it sits. I would love to see the bathroom, and a floor plan, not visualizing how the bedroom and porch are situated – a floor plan would help. Size, dimensions and foundation type? This is stunning…would love to see a floor plan if you have it!! How can I get the floor plans for this house. The layout is just what we have been looking for and is perfect for us. This home is pure genius! I love every inch of it. The combination of modern and gingerly aged is magnificent! A pure gem! I congratulate the new home owners. For me, this looks absolutely perfect! In size, style etc. I want to know about building expense etc. and if i could find any land for something like this. I am interested in the plans and the cost estimates to build as i live in NYC. This Ancient big tiny house looks comfortably large enough for me. I love it! I would really like this, I love the layout. It is just beautiful. Can you advise cost per sq ft to construct? Absolutely stunning! I would move-in in a heartbeat… whereever it sits Throggsneck, NY perhaps? I would love to see the bathroom & a floor plan to visualize where the bedroom & Porch are situated. A floor plan would help size, dimensions & foundation type? This is stunning… would love to see a floor plan if you have it! The layout is just what I have been looking for and is perfect 4me. This home is pure genius! I love every inch of it. The combination of modern & gingerly aged is magnificent! A pure gem! I congratulate the new home owners. Please show a complete house plan ‘b’ with bedroom & bathroom. I want to build in ThroggsNeck, New York (Bronx) 10465. Please contact me. Love this house. Its beautiful. Would like to know the floor plan and cost ….. I would like to see the bathroom and bedroom size. Someone mentioned a loft I don’t see anything about a loft. Please show a complete house plan b with the bedroom and bathroom. I want to build this in Lommel BelgiumTX. Hello, I would love to know the cost of this house please. Do you build in Massachusetts or NH? Thanks so much! Gorgeous!!! I Love It!!! Love the House!!! Please show a complete house plan b with the bedroom and bathroom. I want to build this in TX.